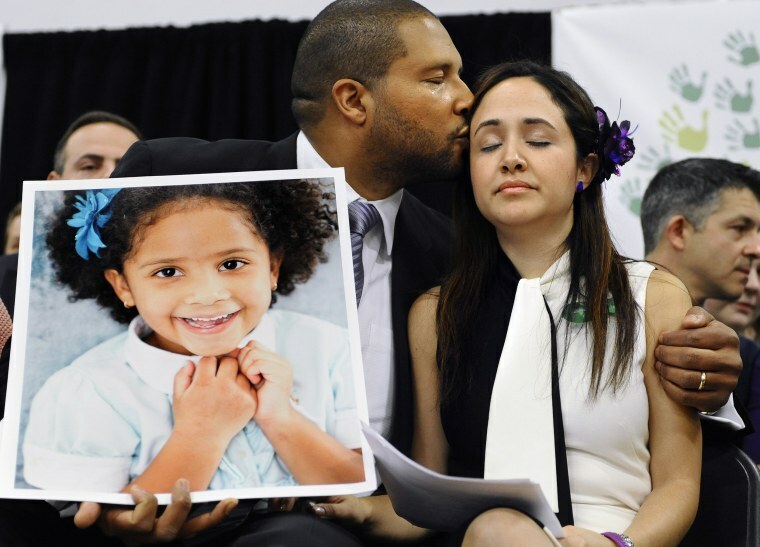 “It feels like Facebook is waiting for someone to die before something gets done,” said Nelba Márquez-Greene, mother of a child killed in Sandy Hook. Nelba Márquez-Greene wondered aloud what it would take to get Facebook to listen. Her 6-year-old daughter, Ana Grace, was killed in the Sandy Hook Elementary School massacre in 2012, and her family has since become the center of one of the many conspiracy theories that abound on Facebook and across the internet, spurred in part by claims from Alex Jones and his conspiracy-filled website, Infowars, that the shooting was “manufactured” by the government. For the past six years, Márquez-Greene has fended off vitriolic trolls on the social network who claimed that her daughter never existed or was a part of a government conspiracy. “It feels like Facebook is waiting for someone to die before something gets done,” she said. Amid Facebook’s recent efforts to clean up misinformation, propaganda and harassments on its social network, Infowars has become the go-to example for Facebook critics who say the site has been too lenient on far-right news organizations. Márquez-Greene sees the issue from a different angle. For years, she and a group of volunteers who help report false information about the Sandy Hook shooting to Facebook have tried to talk to company officials but have gotten little to no response. While she insists she doesn’t speak for all parents who lost children in the shooting, which took place in Newtown, Connecticut, Márquez-Greene says she and a group of volunteers have asked Facebook to be allowed some input into their content moderation policies. Facebook and Twitter have spent months meeting with policymakers and right-wing interest groups in hopes of assuaging concerns about what conservative politicians have deemed “bias” and “censorship” on the platform. Congress held a hearing on Tuesday with Facebook, Twitter and Google executives about the topic at which committee members ironically pushed the kind of false or distorted information that has become pervasive on the platform. Victims of tragedies like the Sandy Hook shooting and their families, however, have been largely left out of the conversation. Ryan Graney, who leads a group of volunteers spearheading efforts to pull Sandy Hook conspiracy content, said there is no formal way for such families to reach a human being at Facebook. Facebook responds to requests to take down harassment and hoax content with form letters. Graney has been reporting Infowars to Facebook for years on behalf of the family of Vicki Soto, a 27-year-old first-grade teacher who was killed at Sandy Hook. Graney said people who believe in the conspiracy have screamed at her on the phone, and one even showed up at a 5K race held in memory of Soto. Graney volunteered for the Vicki Soto Memorial Fund, which hosted the race. InfoWars, which helped promote the false conspiracy theory that the Sandy Hook shooting was “synthetic” and “completely fake with actors,” is verified in the “News & Media” category on Facebook. Between InfoWars and Jones, who is also verified on Facebook, verified Infowars pages have over 2.5 million fans on the platform. As Facebook faced Congress this week and made a public relations push, trying to get members of the press to ask about its new initiative to fight disinformation, the company did not have a clear answer on why one of the country’s leading disseminators of false conspiracy theories is allowed to break the platform’s three-strikes rule. Defending the company’s otherwise hands-off position on conspiracy theories to Recode editor Kara Swisher, Facebook founder Mark Zuckerberg sparked a wave of criticism Wednesday by saying the social network would allow Holocaust deniers a community on the platform. Márquez-Greene believes she’s met that threshold of “organized harm” on the platform for half a decade. After years of Sandy Hook hoax pages living on Facebook’s platform, a company spokesperson told NBC News that it had quietly pulled one of the largest pages, “The Hoax at Sandy Hook,” which has 12,000 members, after the Feb. 14 shooting at Marjory Stoneman Douglas High School in Parkland, Florida, left 17 dead. After Parkland, conspiracies calling some of the dead students and survivors “crisis actors” saturated the platform — a nearly identical accusation to the one leveled at Sandy Hook parents. Graney said she had immediately snatched up “The Hoax at Sandy Hook” name shortly after the Parkland shooting to prevent the page from reappearing, but similar Sandy Hook hoax groups still live on Facebook under different names. A new policy says that Facebook “will remove content that purposefully targets private individuals with the intention of degrading or shaming them,” but it does not apply to public figures. Neither Márquez-Greene nor Graney had been alerted to the policy shift. When asked if the company algorithmically flagged content with “hoax” or “crisis actor” alongside names of prominent recent tragedies to the company’s moderation team, the Facebook spokesperson said it did not, but it is considering future technological solutions. The spokesperson said the company has had internal discussions about a potential hotline or a formalized way for victims of high-profile attacks to talk to an actual company representative, but it may not be possible with a user base of 2 billion people. Facebook said it had also been in touch at one point with those who run the charity Sandy Hook Promise, and that it is now deploying “stakeholder engagement teams” in the wake of tragedies that they hope will work “on the ground” with local victims groups and law enforcement to keep conspiracy theories off the platform. After Márquez-Greene tweeted last Friday about her disappointment that “not only did Facebook allow for the Sandy Hook Hoax page to stay up, they suggested it (to her as) ‘a page you may be interested in’ based on geographic algorithms,” the Facebook spokesperson said the company reached out to Márquez-Greene about her experience. Márquez-Greene said she has not heard from the company. Both Márquez-Greene and Graney said that Facebook relies too much on users — who are often personally affected by tragedy — to grapple with scammers and trolls posting inflammatory and gory pictures of dead family members. Márquez-Greene has two requests for the social media company. “I just wish there was a 1-800 number and a round-table discussion with people who have been impacted by their policies," she said. CORRECTION (July 20, 2018, 12:30 p.m. ET): An earlier version of this article misidentified which Sandy Hook-associated charity hosted a 5K race held in memory of Vicki Soto. The race was hosted by the Vicki Soto Memorial Fund, not the 26.4.26 Foundation.